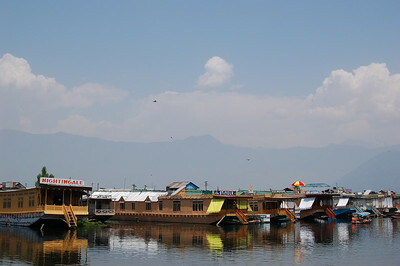 Most people who come to Srinagar stay on one of the famous houseboats of Dal Lake. Dal Lake sits right in the centre of the city and there are thousands of houseboat owners vying for tourists. Although reportedly calm and peaceful they also are home to some very annoying potential scams. The main one involving the fact that the only way on or off the houseboats is by small rowboats. We decided that we didn't have the energy. We stayed 'on land' as the only guests in a quiet hotel in the tourist district of Srinagar (that was noticeably lacking in tourists). 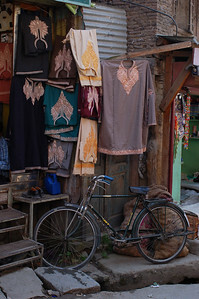 The old streets of Srinagar are lined with beautiful wooden building and balconies but the tourist district is a more modern and polluted section of town. I blame the pollution for the nasty chest colds that both Yann and I developed over the course of our week in the city. On our first morning in town, we sought out an internet cafe to check the local news: one death on the Jammu-Srinagar highway after a grenade was thrown at a convoy carrying politicians and one shooting death of a protester in a crowd denouncing the degradation of a mosque under Indian control. More protests were planned and some locals told us where they would be so that we could stay away. Most locals seemed skeptical to admit that anything was going on, even the woman at the tourist office denied protests were taking place as a protest marched by the heavily guarded office. 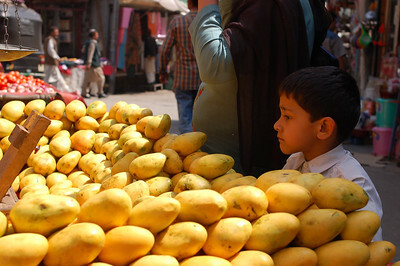 Despite the seemingly bad news, everyday life in Srinagar seems to go on as if everything was normal. It's hard to escape the feeling of occupation in the city. Makeshift sandbag bunkers and barbed wire litter the scenery. 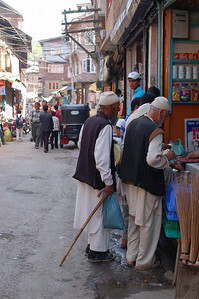 Intimidating crowds of Indian soldiers hang out at every street corner. Kashmiris seem to do a good job going about their daily lives but its impossible to escape the Indian presence and control in the area. Everything from traffic to curfews is decided by the army. One boy proclaimed "even the police are afraid of the army, they don't answer to anybody" and another explained "if ever there was a referendum 10% of people (the corrupt) would vote for Pakistani control, the other 90% would vote for independance". Kashmiris have a visibly different culture from their Indian neighbours. Every morning we purchased hard, flat, pretzel like breads for breakfast, meat is readily available and there aren't so many cows roaming the streets. 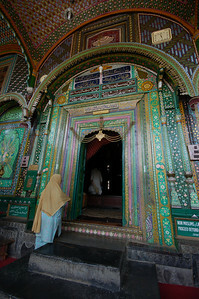 Most evenings we went to bed to the sound of Islamic spiritual chanting from the mosque next door to our hotel. Locals were happy to let us visit mosques, take photos, while proudly reciting the origins of the buildings, many with Persian influence (and absolutely beautiful). 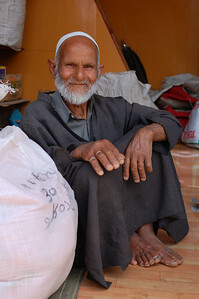 Most women wear a long black tunic with colourful hand embroidery around the collar, younger men sport the usual jeans and t-shirt, but older men wear the two piece white suit and a mandatory vest. Neither Yann nor I could resist getting ourselves Kashmiri vests from a little old tailor who insisted to me that they were unisex, even though I never once spotted a woman wearing one. As you might recall, the reason we were in Srinagar was to catch a bus to Ladakh. When we asked locals about the bus, most responded that it wasn't leaving for another few weeks (the Kashmiri version of solidarity seems to be to keep tourists in Kashmir for as long as the possibly can, even if that means holding them hostage on their houseboat or lying to them about road closures). Even the bus station attendants claimed to not know when the first bus would tackle the two day journey. They recommended we come to see them everyday, because they would start selling tickets as soon as the army gave their approval. We gave ourselves an approximate 10 day waiting period, at which time if there weren't any buses we would turn around and head back the way we came. One evening we spotted another tourist (a rare sighting in the area) and I ran after him to ask him if he had any information about the highway. Our assumption that he was also heading to Ladakh was correct and we exchanged stories over dinner about our lack of information about the highway. Thus began the beginning of our month long journey with German Jochen who decided we seemed to have some idea of what we were doing so we might be a good couple to travel with. Other than sharing the same travel philosophy his mother might possibly worry about him more than Nicole worries about Yann so we had lots to talk about. We waited only 4 nights in Srinagar before we got the news that we could buy tickets for the first bus ride of the year to Leh, leaving on May 1st. I spent most of the last days in bed sick (this is becoming a pattern) and Yann and Jochen went on some adventures, renting a motorcycle that broke down halfway through their trip, getting harassed by a crazy man, having tea at a hotel owner's mansion, poking a snake with a stick and getting interviewed for local television (really I don't have all the details of this excursion so that's about all the information I can provide). Other than the terribly annoying shikara (rowboat) drivers and the oppressive Indian army, the locals were extremely friendly and seemed genuinely happy to see us visiting their city, even without the tickets to Leh we still would have been happy with our trip to Kashmir, unless we had been hit by a grenade, that would have really sucked. Faites attention a vous et essayer de vous reposer un peu. On vous embrasse et on vous aime beaucoup beaucoup. Wonderful to read about your adventures in India. Janice forwarded your blog url to me. It takes me back 12 years to when I went to India, and also made my way up to Leh, although we went via Manali, and unfortunately at the time it was too dangerous to cross to Srinagar. It's great to read about the place though and see the photos. I have to say you are very brave, after the first few bus rides - especially the 36 hour one up to Leh, I got cold feet and wanted to get on a plane to return! Looking forward to hearing your take on Leh. Sorry to hear you've been sick but I guess that is part of the experience. Hope your trip continues to be a wonderful adventure and experience, and look forward to singing you a song when you get back. You had better give us some notice though so we can rehearse! Profites-en, surtout que ce n'est pas tous les jours que l'on peut se laisser feter et surtout en Indes. On t'embrasse tres forts et toi aussi ma belle Emilie. Je suis très emu ce soir à lire vos exploits et aventures"Une amie se fait opérer demain et vos aventures me changent les idées. 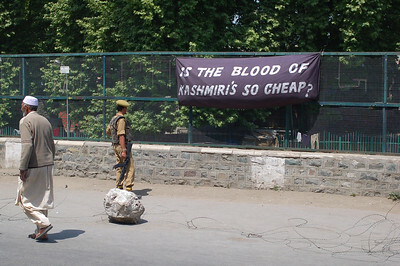 "is the blodd of Kashmiris so cheap" a pesésur moi.Puisque vous semblez être des voyageurs d'experience je m'inquiète moins mais des fois je me demande pourquoi.